What does voicing achieve, what happens during the process and why is it necessary? 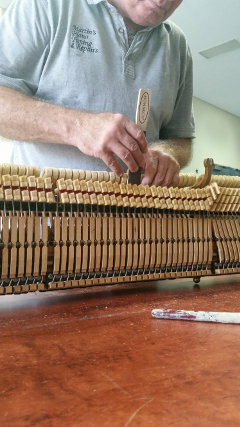 Sometimes, your piano might sound dull and the hammers could require some form of hardening. But most times voicing is required for the opposite reason. In short, when the tone of your piano becomes strident, or ‘tinny’, it should be voiced. Voicing removes the harsh, high harmonics from the sound. When the tone of your piano is incorrect, it becomes difficult to tune, sometimes impossible. There have been a few voicing methods used over the years. I prefer needle voicing. 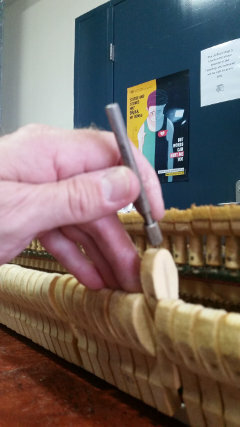 Needles are inserted into the hammers at certain angles relaxing the wool fibres and in turn, making the tone of the piano much more agreeable to the ear. And it’s surprisingly inexpensive, given the outcome!! Why is voicing necessary? Due to how the hammers on your piano are made and the tremendous pressure they are under from continual use, hammer felt will eventually becomes very hard. Sometimes, hammers are ‘doped’ in the factory on purpose to add volume and will definitely require voicing. Voicing softens the hammer heads and the tone of your piano. Most often, your hammer heads will also need some re-shaping, as well as voicing. Having your hammers voiced adds that touch of excellence to the tone of your piano. It is well worth the effort. 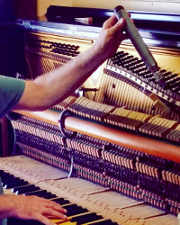 © 2019 - Martins Piano Tuning & Repairs. All rights reserved.Beans theme for WordPress.